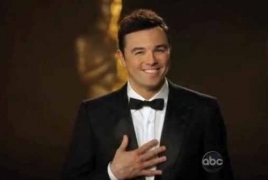 PanARMENIAN.Net - Seth MacFarlane is set to topline his first live-action TV series. Fox has given a 13-episode straight-to-series order to an hourlong comedic drama series created and executive produced by the Family Guy creator, who is also set to star. The series is slated for the 2017-2018 television season, with a pilot episode likely filmed in late 2016, and the rest of the episodes in spring 2017. 20th Century Fox TV, where MacFarlane has been under an overall deal for a long time, is the studio, Deadline said. MacFarlane has done voice-over work on his animated series, most notably Family Guy, for which he has won an Emmy, but this Fox logo horizontalis his first live-action series-regular gig and the first live-action series he has created.